On Friday the Atlanta Film Festival kicked off its 41st year with bang. That bang came in the form of a fantastically weird crowd-pleaser called Dave Made a Maze. The movie, whose title is appropriately meta and is even described hilariously by one of the characters as “a bit on the nose” follows a struggling artist named Dave (Nick Thune) whose constant failures and inability to finish anything he starts drive him to start an ambitious, albeit absurd project. As we see through the eyes of his girlfriend, Annie (Meera Rohit Kumbhani) in the opening scene, Dave decides to create a cardboard maze in the middle of their living room. The seemingly tiny maze is crudely stitched and glued together with various shards of cardboard and paper. “ENTER” appears on a little door in crooked letters. Steam shoots through paper towel rolls like little chimneys as faint noises echo from the handmade hut. Annie circles in confusion as she yells to Dave who appears to be trapped inside. Annie’s appropriately perplexed as she makes a sandwich and attempts to understand just what the hell Dave is doing in there. Annie eventually realizes she’s gonna need some help. She calls over a group of their friends, who are all lovable weirdos. Director and co-writer Bill Watterson said he based the group of friends on people in his own life, which translates into characters that actually feel like they know and love each other. They’ve not only got great banter, but they have inside jokes and an evident history together. Ignoring Dave’s warnings, Annie leads the group of pals into the maze in hopes of rescuing him. The maze, which is filled with corridors, labyrinth-like traps and creatures made of various craft supplies, is very much alive. As the group wanders the halls the maze seems to grow exponentially. The DIY, arts-and-craft production design is insanely good. Each set piece is mind-blowingly intricate. My favorite one involves a room in which a cardboard monster burbs origami. 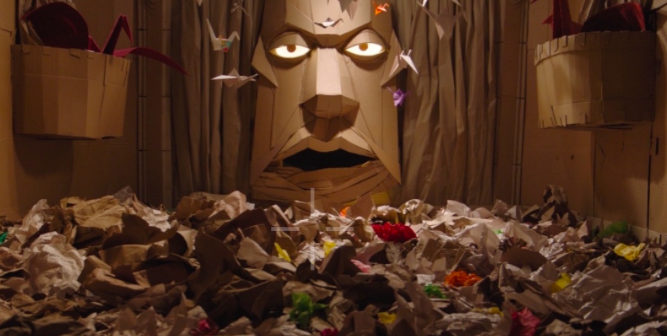 The movie all of the sudden feels like an adventure film as the group navigates through the cardboard halls. Think Raiders of the Lost Ark meets Peewee’s Playhouse. Dave and his friends eventually meet up but that’s only half the battle. Not only are they still lost and confused but they’re cautiously avoiding Dave’s most threatening creation: a giant, cardboard Minotaur who’s hot on their trail. Tonally, Dave Made a Maze is not always the most consistent. This is summed up in a scene where a character’s head is cut off and instead of blood shooting out, red sparkly confetti explodes from her neck as our leads scream in horror. That being said, even as I wrote that I couldn’t help but smile at its weirdness and appreciate the refreshingly off kilter choices that Watterson and team made. The movie very much feels like a labor of love. Judging from Watterson’s reaction to an audience member’s question about the budget I’m assuming they weren’t working with much, which makes it all the more impressive. Chalk full of visual treats, I would recommend the film to any aspiring art directors or anyone interested in production at all. Dave Made a Maze is a great time at the movies thanks to some lovable characters and an unforgettable visual style. Check out the film’s website davemadeamaze.com to see when the film will be screening in your city!